“Resilience and transformability are not ‘opposites,'” cautioned Brian Walker at the Resilience 2011 conference. “They are compatible aspects of a complex adaptive system that functions at multiple scales” (video and slides). I think of resilience-and-transformation as a duality: each defined in relation to the other, and together comprising a whole. 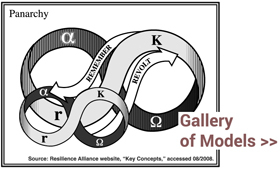 As systems thinking can be understood as both systemic-and-systematic or as including both analysis-and-synthesis, resilience thinking includes both system resilience and system transformation. Skillfully navigating this duality is one of the strengths of Bruce Goldstein’s 2012 edited volume, Collaborative Resilience: Moving Through Crisis to Opportunity. Communicative resilience goes beyond suggesting that joint fact-finding and collective sensemaking can help a community better understand social-ecological relationships. It suggests that the system does not preexist the collaborative, which draws on diverse knowledge practices and storytelling to define it, their place in it, and its preferred condition. It is a coproductive dynamic, as system conditions are determined and reshaped through collaborative interaction.